Five skeptics were arrested this morning following sit-in at the Bolingbrook Golf Club. The protesters had hoped to disrupt the All American Celebration scheduled for today. 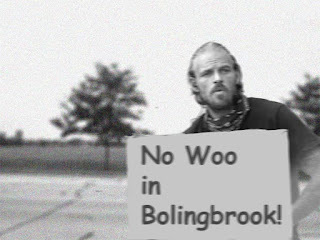 The protest was organized by the Bolingbrook Skeptics to call attention to what they believe is the “overwhelming presence of woo” in Bolingbrook. Around 7 AM, 20 people gathered at one of the street entrances to the Golf Club. Five of them sat down in an attempt to block access. A meeting with Mayor Roger Claar. Ban the sale of all homeopathic products in Bolingbrook. All psychics must be approved by the Bolingbrook Skeptics before they operate in Bolingbrook. No more business licenses granted to chiropractors. Revoke the business license in Bolingbrook that prints or posts on the Internet stories that promote believe in UFOs, Bigfoot, Ghosts, and other paranormal beliefs. Revoke voting privileges for anyone cannot tell the difference between quantum physics and magic. Require all residents to attend special speaking engagements, to be paid for by the village. Quarantine all residents who refuse to be vaccinated. Around 10 AM, a disheveled Claar walked up to the protesters. He introduced himself and then shook the hands of each of the protesters, asking for their names. The Bolingbrook Police Department and PZ Myers refused to comment.